Spiritual moderators of diocesan councils of Catholic Women stand with affiliate presidents and national affiliate past presidents. ORLANDO | When Hurricane Michael made landfall in early October 2018, it caused the Florida Council of Catholic Women to reschedule its biennial meeting in celebration of the province’s 50th anniversary. What the storm did not do was daunt the spirits and true grit of the council, which spurred into action to help those hit hard in Florida’s Panhandle. The council’s biennial convention was scheduled Oct. 11-14 in Tallahassee. But the hotel was needed as shelter for the many compelled to evacuate the devastating destruction of the storm. The event was cancelled, and those members registered for the event were given the opportunity to donate some or all of their registration cost to Catholic Charities of North West Florida to aid in the relief of those impacted by the storm. As a result, a check for $9,000 from the Florida Council of Catholic Women was presented to Catholic Charities. 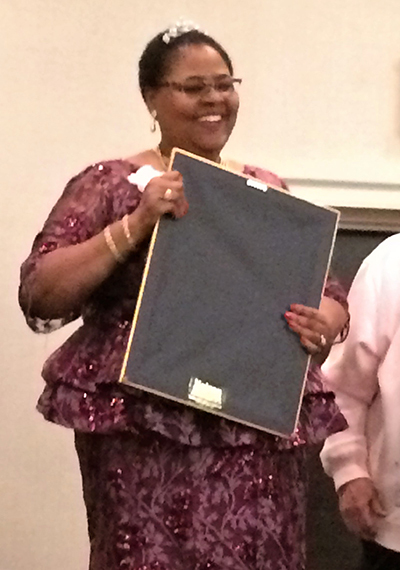 Josephine Gilbert, past president of the Miami Archdiocesan Council of Catholic Women, receives the Our Lady of Good Counsel Award at the 2018 Florida Council of Catholic Women's annual convention, held in February in Orlando. The event was postponed by the passage of Hurricane Michael. Miami Archbishop Thomas Wenski sent his greetings and congratulations. 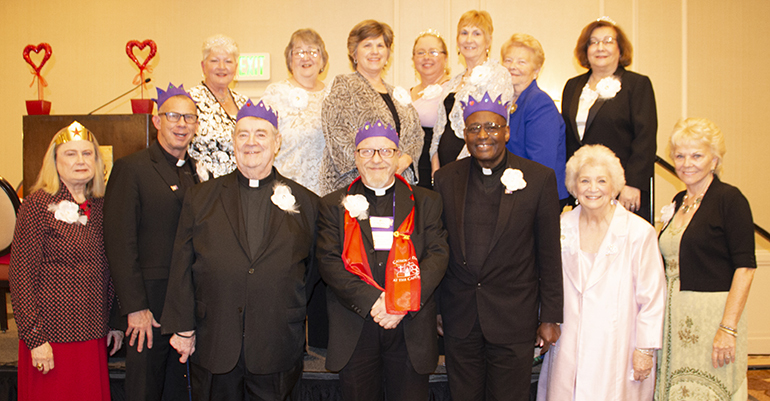 All seven of the dioceses’ Councils of Catholic Women participate in supporting the many priorities of the Florida Conference of Catholic Bishops but each of the presidents selected one of the initiatives to present. Catholic education is a priority of the bishops and in the Diocese of Orlando, its councils have supported this effort by volunteering in the schools, providing much needed financial assistance and lobbying legislators. Children Matter is a program to provide desperately needed clothing to agencies assisting children in distress. 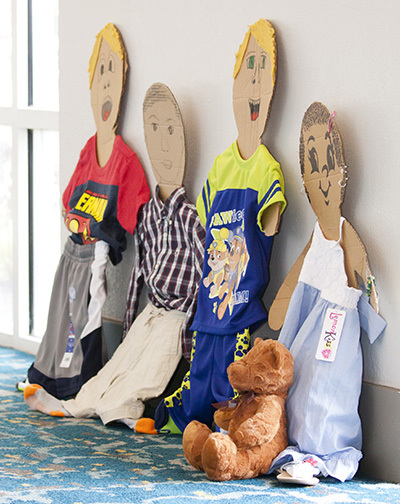 Lisa Shelly, president of the Miami Council of Catholic Women, explained how, in 1998, Diane Tugander, immediate past president of the Florida council, brought the cardboard doll campaign home from the national convention and the women have been participating ever since. On display at the Miami Archdiocesan Council of Catholic Women's 2017 convention were dozens of children's clothes which had been donated for needy children. Agriculture and tourism are predominant Florida industries which hire significant numbers of low-paid workers – many of them immigrants. Mary Woltman, president of the St. Petersburg Diocese Council of Catholic Women, highlighted their work to address the horrific effects of human trafficking through support of the Bridging Freedom initiative. Every year, Catholics from throughout the state travel to Tallahassee to participate in Catholic Days at the Capitol. It is an opportunity for the faithful to call upon the legislators to protect and defend the dignity of human life and to promote the common good for all people. This year’s event is March 26-27. Advocating for issues as they pertain to Catholic faith and values is also a major focus for the Diocese of Pensacola-Tallahassee. Mary Sauvageau, president of the Panhandle diocese’s council, said councils and their affiliation presidents were challenged to budget funds to sponsor a member who had never attended Catholic Days. A little-known fact is that by virtue of baptism, all Catholic women are members of the Council of Catholic Women. Individually and collectively, working together with the bishops, the world is transformed by their service in love. With four dioceses formed: St. Augustine (1870), Miami (1958), St. Petersburg and Orlando (both in 1968), Florida affiliated with national council as the Province of Miami Dec. 2, 1968. The Diocese of Pensacola-Tallahassee was formed in 1975, Venice Diocese and the Diocese of Palm Beach both followed in 1984, bringing the Province to its current seven dioceses. In its 50 years, the Florida council has been blessed with four national council presidents: Winkie LeFils 1979-1981; Ellen Bachman 2007-2009; Judy Powers 2011-2013, and Sheila Snow Hopkins 2015-2017.